2011 BROWN & SHARPE GLOBAL ADVANTAGE 7-10-7 CMM, W/ PC-DMIS SOFTWARE, AUTO PROBE, RENISHAW PROBE, S/N 0111-1403UA. 2009 MICRO VU EXCEL 654UM PRECISION MEASUREMENT SYSTEM, 650mm X 650mm X 400 mm (XYZ) WITH AUTO PROBE CHANGER. LARGE SELECTION OF INSPECTION TOOLS, PIN GAGES, MICS, CALIPERS, BORE GAGES, ETC. LARGE SELECTION OF KURT AND CHICK VISES. LARGE SELECTION OF CT-40 HOLDERS, CUTTING TOOLS, CARBIDE INSERTS, BORING TOOLS, COLLETS, INDEXERS, END MILLS, AND SUPPORT. WEBB 17’’ X 40’’ GAP ENGINE LATHE, 12’’ CHUCK, 3’’ THRU HOLE. 1984 AMADA RG-80, 8FT X 88 TON HYDRAULIC CNC PRESS BRAKE, WITH NC9EX 3 AXIS CONTROL, S/N 806074. AMADA M-2545, 8FT X .25’’ MECHANICAL POWER SHEAR, W/ CNC BACK GAGE. AMADA CS-220, 10 GA HYD CORNER NOTCHER. HAEGAR HPB-C, 6 TON HYD INSERTION PRESS. BURR KING SANDER AND TUMBLERS. MOBILE TUMBLER 20’’, 2 TANK CAP, 10 X 2L. DIRECT CNC MODEL 8600 HOTWIRE CNC FOAM CUTTER WITH ROTARY ATTACHMENT, 8FT X 6FT X 4FT. NISSAN OPTIMUM 5000 LB LPG FORKLIFT. 2005 MAZAK VARIAXIS-500-5X, 5 AXIS CNC VMC WITH DUAL PALLET CHANGER, MAZATROL 640M-5X CONTROL, CT-40, COOLANT THRU HIGH PRESSURE. 12,000 RPM, 20’’X20’’X18’’ (XYZ), 19’’X15’’ TABLE SIZE, 40 ATC, S/N 175048. 2001 MORI SEIKI SV-503/40 5 AXIS CNC VMC, WITH FANUC CONTROL, 30ATC, CT-40, 10,000 RPM, HIGH PRESSURE COOLANT THRU SPINDLE, S/N SV500A12920. 2011 HAAS TM-2P CNC TOOL ROOM MILL, W/101 ATC, 40’’ X 16’’ X 16’’ (XYZ), CT-40, 6000 RPM, 4TH AXIS READY, S/N 108942. 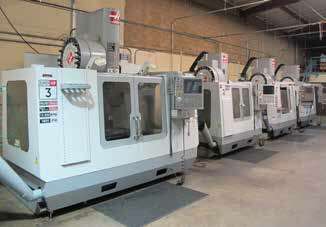 2008 HAAS VF-2B CNC VMC, 7500 RPM, CT-40, 24 ATC, PROBING, TOOL PRE SET, S/N 1069592. TOOL PRE SET, PROBING, S/N 37564, 35274. 2004 HAAS TM-1 CNC TOOL ROOM MILL, 6000 RPM, CT-40, 10 ATC, S/N 345554 HAAS TR160Y COMPACT DUAL AXIS, 5TH AXIS TRUNION TABLE. HAAS 4 SPINDLE 5C, 5TH AXIS ROTARY TABLE. HAAS HRT160 4TH AXIS ROTARY TABLE. HAAS HRT-210B 4TH ROTARY TABLE. 2) HAAS HA5CB, 4TH AXIS ROTARY INDEXERS. NIKKEN 5AX-200 5TH AXIS TRUNION TYPE ROTARY TABLE. 10’’ CHUCK, 3’’ THRU HOLE, S/N CT3000607. 2000 HWACHEON HI TEC ECO 10 CNC LATHE WITH FANUC OT CONTROL, 10 POSITION TURRET, 8’’ CHUCK, TAIL STOCK, CHIP CONVEYOR, S/N H082348B3FC. 1998 HWACHEON HI TEC ECO 10 CNC LATHE, WITH FANUC OT CONTROL, 10 POS TURRET, 8’’ CHUCK, TAIL STOCK, CHIP CONVEYOR, S/N M082346E6FA. COLLETS, INDEXERS, END MILLS, AND SUPPORT. 2006 HAAS VF-4B CNC VMC, 5TH AXIS READY, 10,000 RPM, CT-40, 20 ATC, 50’’ X 20’’X 25’’ (XYZ),S/N 48295. 2003 DAEWOO PUMA 240-LC CNC LATHE, FANUC 21i-TB, 10’’ CHUCK, 3’’ THRU HOLE, S/N CT3000607.